After a lackluster week of pictures, today I decided to actually go out and "Discover Kuwait". First me and Nat decided to have lunch at McDonalds in the Mishref Fairground. Its an interesting McDonalds built to look like a old Kuwaiti house. The most surprising thing about this branch is they had 3 shotgun rifles on display!! After lunch we decided to go check out the Quarter Mile race track which is located off the side of the sixth ring road. It wasn't too hard finding the highway exit since there were a lot of signs pointing in the direction of the race track, the funny thing though is when you exit the highway the signs stop. So while trying to find the race track I fell upon something a lot cooler.. baseball fields! Sitting off to the side of the road opposite the Kuwait Internal Security Forces complex are 4 small baseball fields. It was such a strange site seeing these very green baseball fields in the middle of summer out in the middle of nowhere. I parked my car and went down for a closer look. No one was around so I am guessing anyone can go play anytime. The baseball fields are called "Florence Alnasrallah Baseball Fields" and I think they are mostly used by the American military and American companies. The reason I am saying that is because I saw a KBR banner on one of the fields and I also saw an event program that mentioned the US military team. So, if you are a baseball fan and are interested in these baseball fields, to find them just get on the sixth ring road heading inland, then follow the racetrack signs on the highway and when you exit the road, take a right and head straight. It should be at the end after the Internal Security Forces complex. I also posted more pictures of the place on 2:48AM.com. The race track was closed by the way so that will be a post for another day. 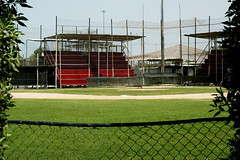 Thats the KLL (Kuwait Little League) field. I used to play there back in 95 or something. It used to be all sand and quite ghetto. I have never tried baseball, I think i should try it now, maybe its a hidden talent in me waiting to be discovered, you never know. so who's up for a round of baseball sometimes this winter? OMG! That picture looks soo different to what the ground looked back in the day! I agree with "thekuwiti" as to how ghetto the fields were back in the day! I remember KLL (Kuwait Little League) and I have pictures of it! I played for the Mets, White Sox, and Red Sox! I miss those care-free days when we had practise twice a week and a game every Friday morning! When I saw the pic I remembered how parents use to cheer the kids on and the little snack shop in the center of the fields! Watching Baseball is boring but playing it is a lot more fun. Which I was part of the little league..
i am fine with a night summer game if anyone else dares trying.